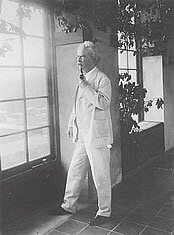 1835-39 Samuel L. Clemens (SLC) born on 30 November 1835 in the village of Florida, Missouri. 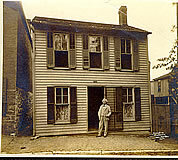 In 1839 Clemens family moves to Hannibal, Mo. SLC's formal education ends; he becomes printer's apprentice. Works at various Hannibal newspapers as printer and as occasional contributor and editor. 1853-55 Leaves Hannibal. Visits St. Louis, Philadelphia, New York, and Washington, finding work as journeyman printer. 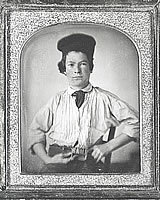 1857-59 Becomes apprentice Mississippi River steamboat pilot, earning license in April 1859. 1861 Outbreak of Civil War ends SLC's piloting career. Serves briefly as volunteer in Confederate militia. Leaves with his brother for Nevada Territory. 1862-65 Reporter on Virginia City (Nev.) Territorial Enterprise and San Francisco Morning Call. Spends nearly three months living and prospecting in the Jackass Hill (Calif.) area. 1866 Travels to Sandwich Islands (Hawaii) as correspondent for Sacramento Union. Returns and lectures about his experiences. 1867 First collection of stories, The Celebrated Jumping Frog, published. Travels to Europe and the Holy Land as correspondent for San Francisco Alta California. Briefly serves as secretary to Senator William Stewart of Nevada in Washington. 1869 Engaged to Olivia Langdon. The Innocents Abroad published. Buys partnership in the Buffalo Express. 1870-71 Marries Olivia Langdon and settles in Buffalo. Sells Buffalo Express interest and moves to Hartford, Conn.
1872-74 Roughing It published (1872). First child, Langdon, dies. The Gilded Age, written with Charles Dudley Warner, published (1873). Makes three visits to England, the second with his wife and baby daughter, Susy. Second daughter, Clara, born. 1876 The Adventures of Tom Sawyer published. Begins work on Huckleberry Finn. 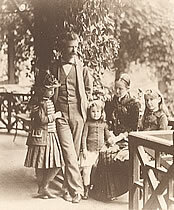 1878-80 Travels in Europe with his family, 1878-79. A Tramp Abroad published (1880). Third daughter, Jean, born. 1881 The Prince and the Pauper published. SLC begins investing in the Paige typesetter. Revisits Hannibal and the Mississippi River. Life on the Mississippi published (1883). 1885 Adventures of Huckleberry Finn published by SLC's own publishing company, Charles L. Webster & Co.
1889 A Connecticut Yankee in King Arthur's Court published. 1891-94 To ease troubled financial situation caused by Webster & Company expenses and typesetter investment, the Clemenses close the Hartford house and relocate to Europe, making extended stays in Switzerland, Germany, France, and Italy. Webster & Company declares bankruptcy in April 1894. Pudd'nhead Wilson published (1894). 1895-96 In order to pay debts, SLC embarks on round-the-world lecture tour that includes visits to Australia, India, and South Africa. Daughter Susy dies in 1896, devastating parents. Personal Recollections of Joan of Arc published (1896). 1897-1900 Following the Equator published (1897). SLC travels in Europe with family; makes extended stays in Austria, Switzerland, Sweden, England. Returns to America in October 1900. Family summers at Lake Saranac in the Adirondacks (1901). SLC goes on cruises aboard his friend Henry H. Rogers's yacht Kanawha, to Nova Scotia and to the Caribbean. Last visit to Hannibal, Missouri (1902). 1903-4 Because of Olivia Clemens's failing health, family relocates to Italy; Olivia dies there in 1904. 1906 Now living in New York City, SLC begins final, concentrated work on his autobiography. What Is Man? published anonymously. 1907 SLC travels to England to receive honorary degree from Oxford. In June, SLC moves into his final home, called "Stormfield," near Redding, Conn.
1909 Daughter Jean dies at Stormfield in December. 1910 Samuel Langhorne Clemens dies at Stormfield on 21 April.